It is now November 2014. NaGaDeMon 2014 is in full swing. If you are unaware, follow that link to the NaGaDeMon website and read up. In short, it’s a challenge to design, and play, a game in the month of November. I’m not participating this year. I’m too busy working on other projects… like last years NaGaDeMon entry. Last year wasn’t particularly productive for me. I used NaGaDeMon as a motivator to get something done. I wanted to design a game to play with Jayme, my wife. She likes zombies and games with a fair amount of randomness. I took an old design, mashed it together with a new mechanic idea, and came up with something I was proud of. All in one month. Also in November, I began working on another project. One that would go on to be my first Kickstarted game: PULL! – A Trap Shooting Card Game. PULL! was a project of necessity. I had made up my mind that I was going to do a Kickstarter campaign, and I had wanted to do it with the zombie game… but, well… I can’t draw zombies. Also, there was a ton of cards needed for the zombie game. I wanted to do something a bit smaller for my first campaign and I wanted to be able to do 100% of the work myself. So, had I been a better artist, my NaGaDeMon 2013 game would have been my first Kickstarter game. It was fast, easy to produce, fun, and had a well-recognized theme. It needed art, so I moved on to other things. A wonderful friend offered to do the artwork for me, but it’s been a long process for him as he’s doing it in his spare time only. This actually turned out to be a good thing. Many people have spoken out against the zombie theme and recently, I’ve had a change of heart about it. I found a new theme and it fits the mechanics perfectly. It’s a beautiful day outside, the sun is shining, and the birds are singing. The humans have packed up their favorite blankets and food, gathered their closest friends, and headed to your park for a picnic. With their afternoon luncheon set up, you and your army are set to engage in battle where the ultimate prize is their delicious food. Operation Picnic is a quick, fun game for two. 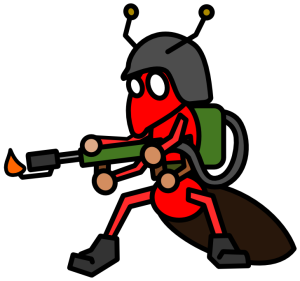 Each player is a commanding general of their ant armies trying to lay claim to the human’s food. They do this by playing soldiers in rows behind the plates of food, and if you can overpower your opponent’s forces on that plate, you win it for your anthill. Once I made this theme change the mechanics suddenly made so much more sense. A few of the cards changed accordingly as I leaned a little more on the theme. I was once happy with this game, now I’m EXCITED for it. I think it has a ton of potential. I want this game to be made. 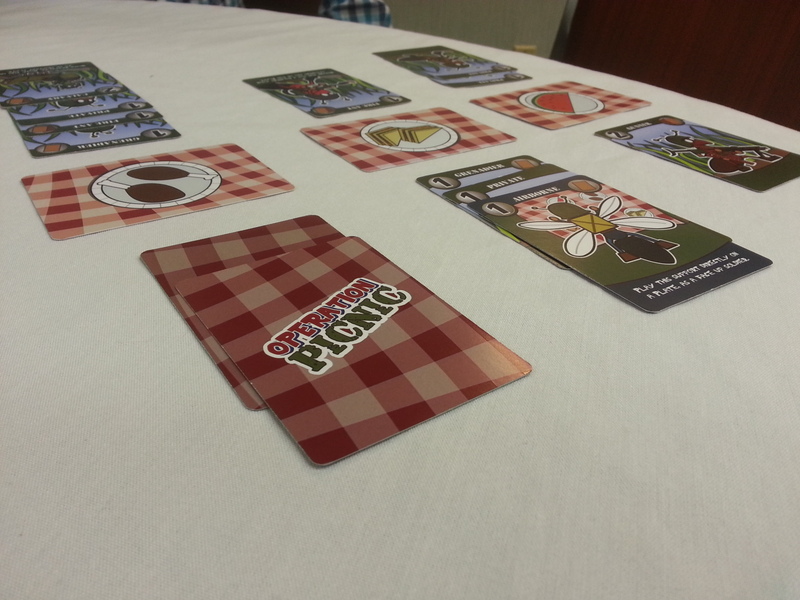 It’s a two player card game… which makes it a difficult pitch for publishers. So, my current thought is that this will someday be self published. If I’m going to self publish, I want it to look amazing… which means hiring an artist… which means raising a ton of capital first. All that to say, I need this game to be the best this game can be, before I decide to do something with it. And that’s where you come in. You can download the Print and Play. It is 90 cards total, and the backs don’t matter. It should be a quick build for anyone that’s done a fair amount of print and play before. You can purchase a BETA deck from thegamecrafter.com for under $10! I recognize that some people don’t have the time or necessary tools to manufacture a prototype, so I’ve provided the game, royalty free, for purchase. I’d LOVE to have you on board to help make this game great. There’s even a third way you can help: read the rules and comment! This game has been tested dozens of times. This BETA test is a very late stage test… but that doesn’t mean the game is perfect. Things are bound to change and when making physical games, it can be a challenge for testers. It’s not like you can just download a patch and it’s all good. If I change cards, you either have to re-make them, or re-order them… and I realize that some people just can’t do that. Nearly everyone, however, can help me make the rules the best they can be. I love sharing with the community. One thing I love about Kickstarter is the way it brings a group of people together to make something real. Typically, it’s a way of crowdsourcing funding… but, I want your help to not only print the game, but to actually create the game. I’m crowd sourcing the entire design. Let’s build this game together from start to finish and make something special! You should record a video walkthrough of the phases of the game so it’s easier to compare your ideas to what the rules explain. Sometimes language can be too ambiguous, making it hard to correctly understand the rules. Being a game of 20 minutes, it could even be a video of a full session. Thanks for the interest Carlos! Doing a play-through video is certainly on my list of things to do soonish.